Inspiron 17 (5749) is a new mainstream/multimedia machine by Dell, which tries to be useful in every situation, combining decent performance, stylish looks, big screen and a long warranty. Actually, the only noticeable drawback in its specs sheet is the weight, which is 3285 g, but that’s not something unprecedented for a 17-incher. We were somehow surprised, though, given the ultra-thin and ultra-light models, which alight upon our Labs lately. Besides the prominent measurements, Inspiron 17 (5749) has an Intel Core i7-5500U processor, GeForce 840M GPU and 8GB of RAM. These specs should be suitable for various everyday activities such as movie/music playback, lightweight gaming, not so demanding computing processes (simple Photoshop manipulations, etc.) and office work. In this review we’ll try to answer all the questions you might be interested in, as we put 5749 through our lab tests. We expected no additional accessories and that’s what we received, but that’s to be expected from a mainstream/multimedia machine. Of course, you won’t be left without your 65W power supply (3.34A, 19.5V). It charges the 5749’s 40Wh battery in about 4 hours (if the computer is turned off). Inspiron 17 (5749) would have a great design if it weren’t for the bulky size. Looking at the product photos, one could imagine that 5749 is thin and light and that’s why the notebook will surprise you when you take it out of its box for the first time. The model weighs 3285 grams (7.24 lbs) and its height is 29.6 mm (1.2”). Five years ago, this would be normal, but today, given the fact that we’re talking about a notebook with a ULV processor, we’re not exactly happy. So much for the criticism. 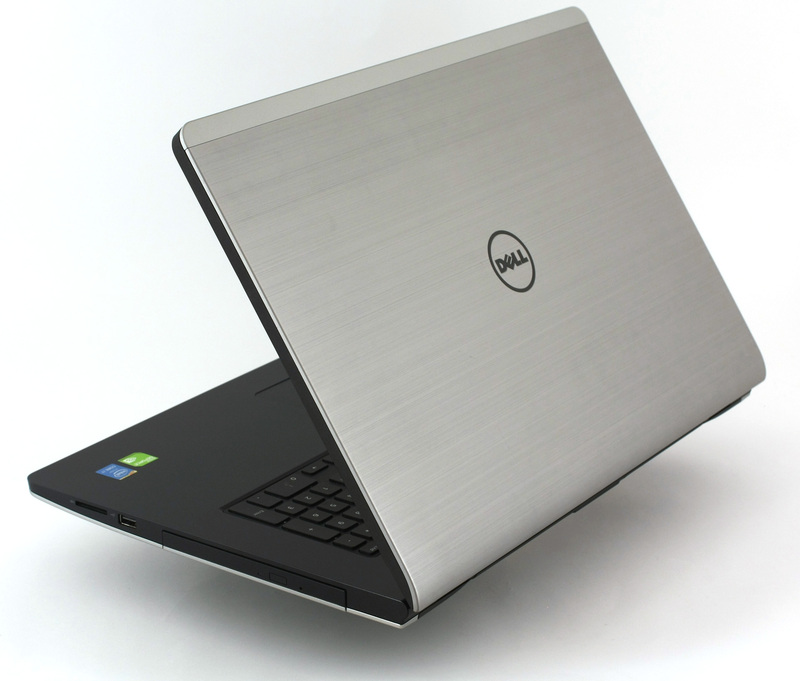 Inspiron 17 has a sturdy construction which feels premium and elegant. The materials used are aluminum and plastic and that makes the model not only stylish, but pretty reliable too. 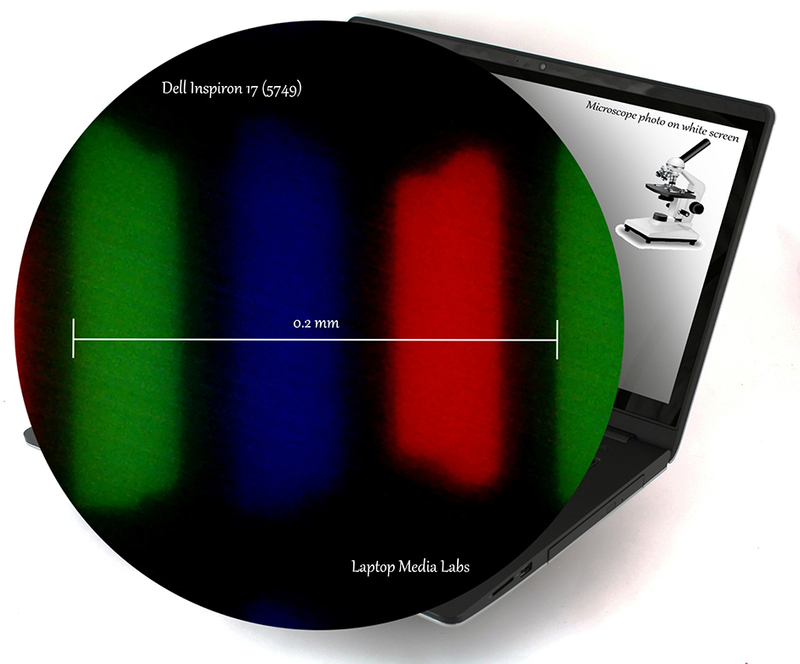 Dell puts all of its notebooks to serious testing before mass production. 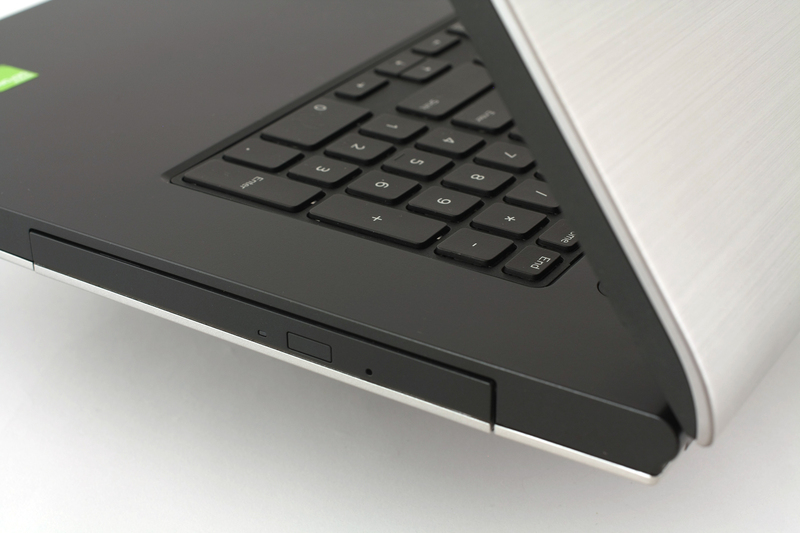 Inspiron 17 (5749) can survive short-term heat conditions of up to 65°C/149°F, opening and closing the lid 20,000 times, 10 million keystrokes of the most common keys and 1 million touchpad button clicks. It will also survive twisting the base and lid more than 25,000 times or after 40,000 pushes of the multimedia buttons. 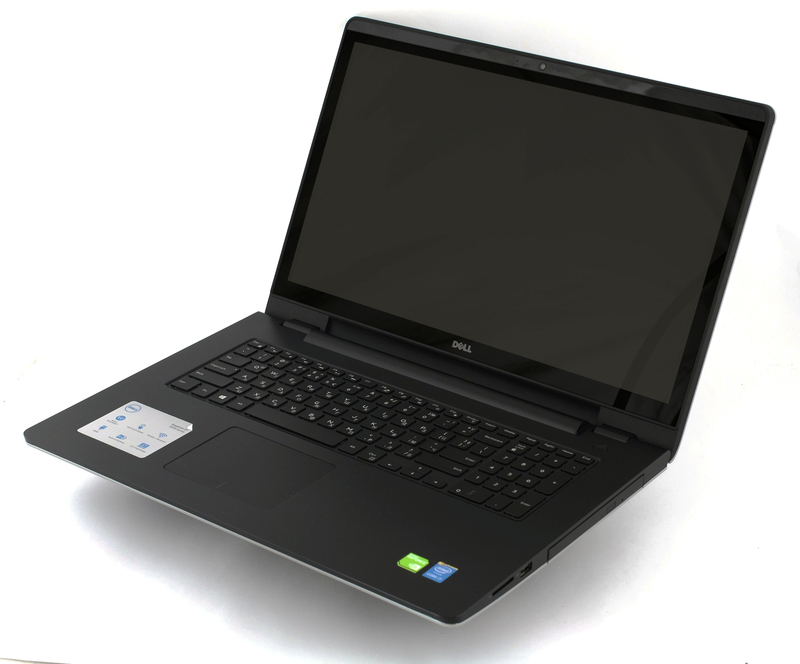 Dell Inspiron 17 (5749) can operate in temperatures ranging from 0°C to 35°C, relative humidity (maximum) – 10% to 90% and vibrations of up to 0.66 GRMS. Dell claims that 5749 can resist 110 G shocks, measured using a 2 ms half-sine pulse when the hard drive is in use. 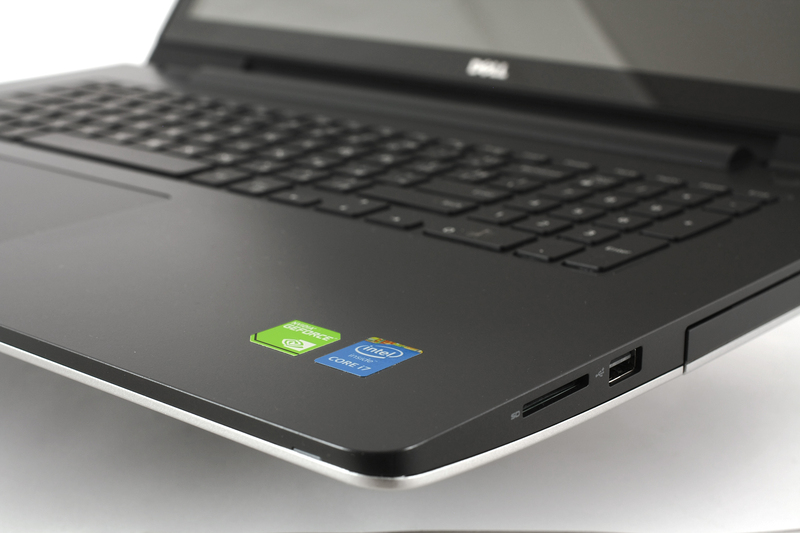 The top lid is covered by brushed aluminum with the traditional round Dell logo placed in the center. The interior is built of black plastic, which collects fingerprints rather easily. 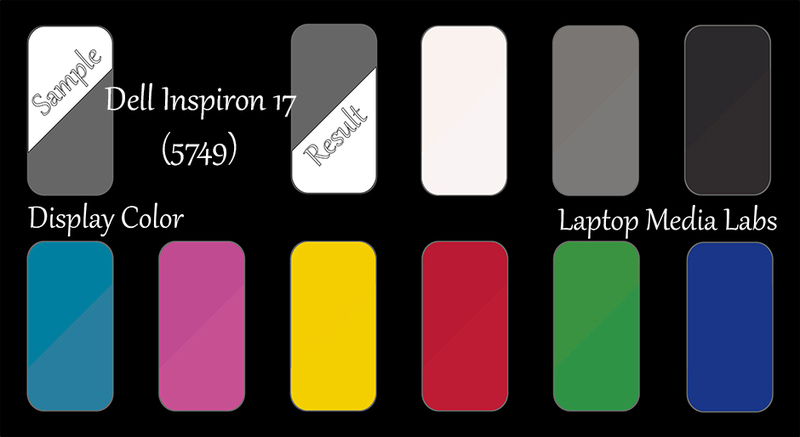 We can admire Inspiron 17 (5749) for its keyboard, which is very comfortable and takes advantage of the space provided by the 17-inch panel. 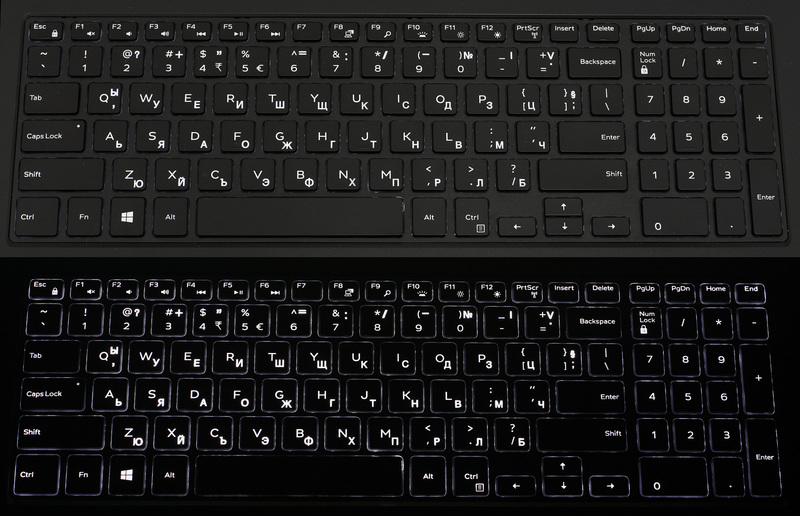 It’s an “Island Style” type and has a dedicated NumPad section with full-size keys. There is also a backlight, so it’s easy to work with it in any ambient lighting. The trackpad is quite large – around 84 cm2 (105 mm x 80 mm), which means that working with it is easy. 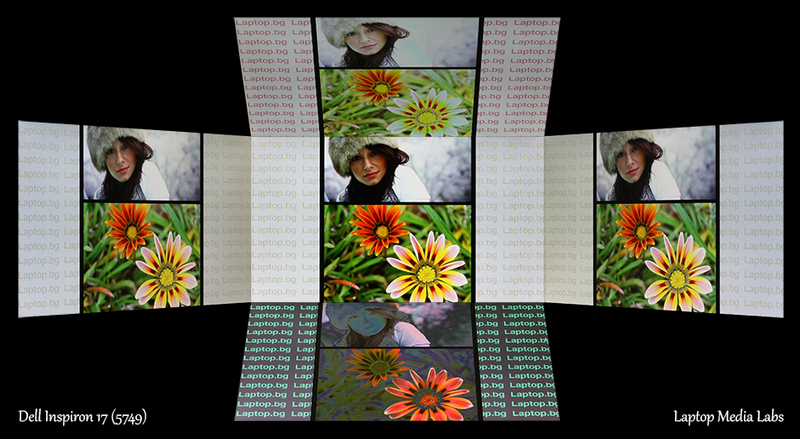 The frame surrounding the screen is fairly thin and in its top center houses an HD camera (1280 x 720 pixels), capable of 30 fps video recording. The viewing angle is 74 degrees, so it’s pretty convenient for video conversations, even if there are some friends around. The screen operating angle is 135°, so it’s suitable even if your head position is at a significant distance above your desk. The left side sports a Security cable slot, Power adapter port, HDMI port, Network port (RJ45), USB 2.0 port, USB 3.0 port and an audio jack. On the front, there is only one indicator LED which is lit when the battery is charging, amber when battery is low and is switches off when the computer is plugged in and the battery is fully charged, or when it is running on battery and the battery has more than 10% charge. 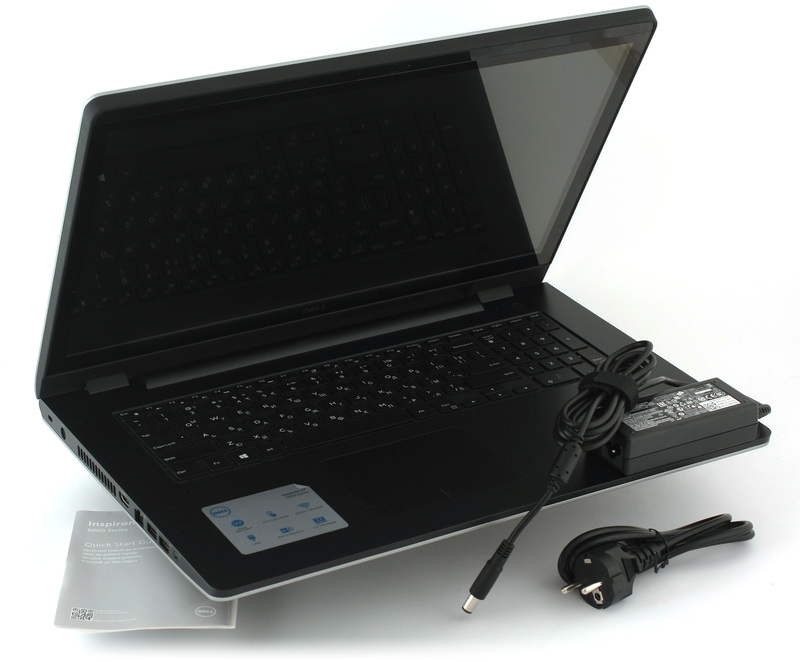 The right side is equipped with a media-card reader (supports SD / SDHC / SDXC cards), USB 2.0 port and an optical drive. Dell uses 3 Gbps interface for that, so if you don’t need it, it’s not a good idea to replace it with a second SSD (since it would be capped to ~350MB/sec), but it should be sufficient for an additional HDD. The HDD, RAM, Wi-Fi card and battery are easy to access. You just have to remove a little cover on the bottom. The optical drive can also be replaced easily. Unfortunately, there is no additional HDD/SSD slot, nor an M.2 slot. The RAM slot is just one. 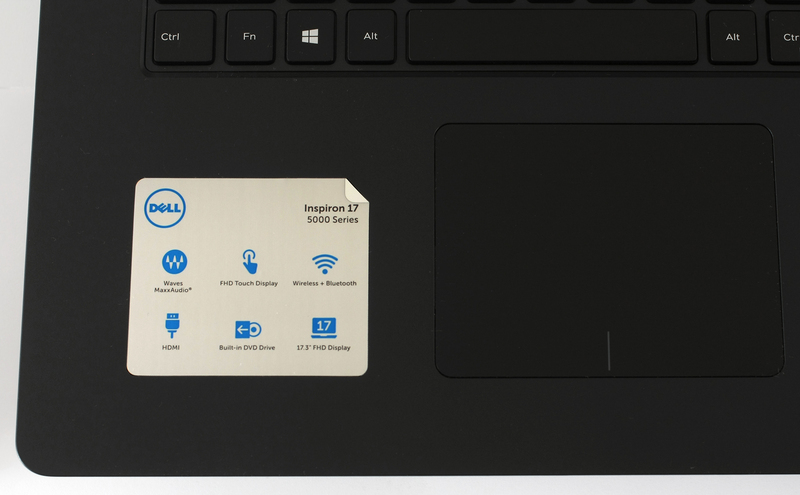 Dell Inspiron 17 (5749)’s display has a Full HD TN capacitive panel with a glossy surface. It’s made by Chi Mei and the exact model is 29JPY-173HGE. The screen has a diagonal of 17.3 inches (43.94 cm) and its resolution is 1920 x 1080 pixels (16:9 ratio). This means that its pixel density is 127 ppi, so it becomes “Retina” when viewed from a distance of over 69 cm. The pixel pitch is 0.1995 mm. Take a look how images appear at 45°. With Inspiron 17 and its True Color utility, you can choose between five display modes, depending on your activity – “Vivid Mode”, “Office Mode”, “Movie Mode”, “Outdoor Mode” and “Natural Mode”, or you can turn them off completely. Here you can see the menu and how the modes control the display settings. We measured the luminance distribution and the color temperature of the display, as well as the color accuracy – DeltaE(76) for each of the aforementioned modes. Unfortunately, none of them got us low DeltaE deviation. 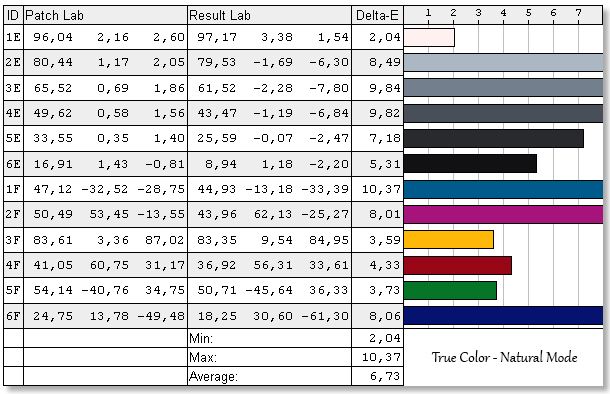 After these tests, we turned off the True Color utility and profiled the display with two different calibrators. 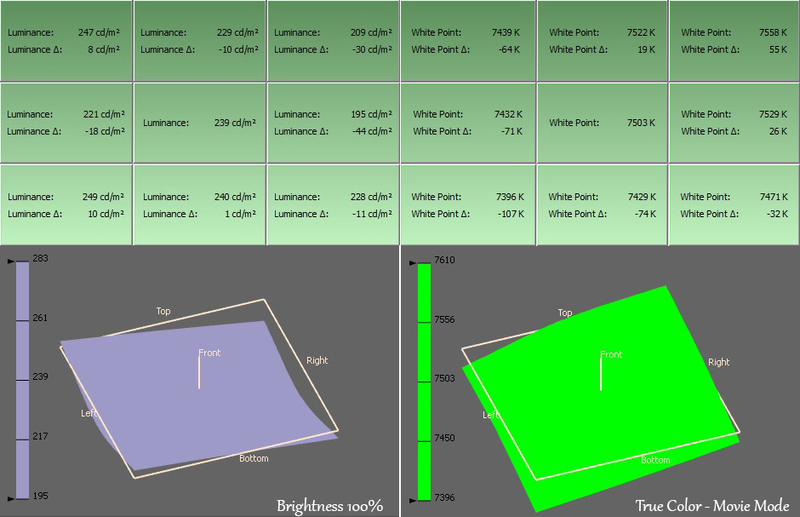 Before profiling, the average value of the maximum luminance (in the display’s different sections) is 243 cd/m2 – not a very good result. The maximum deviation is 17%, which is acceptable. The color temperature, measured on a white screen is 6911K – slightly colder, but still close to the optimum of 6500K (D65). 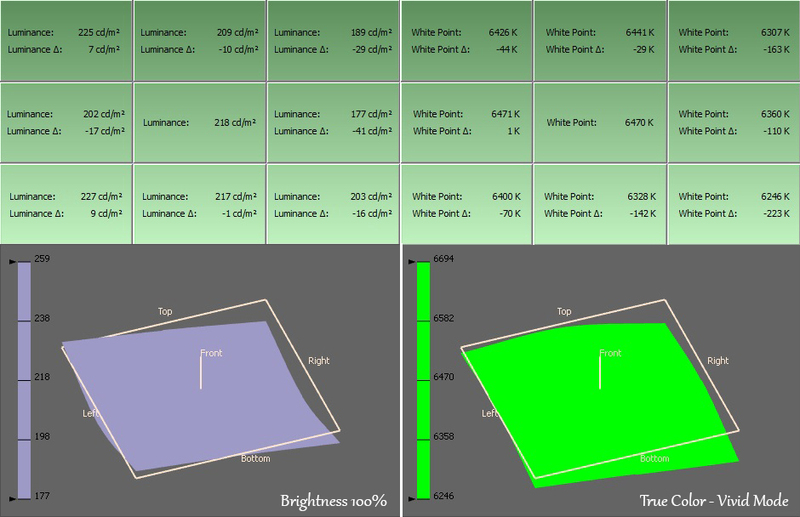 We profiled the display at maximum brightness and its native color temperature. 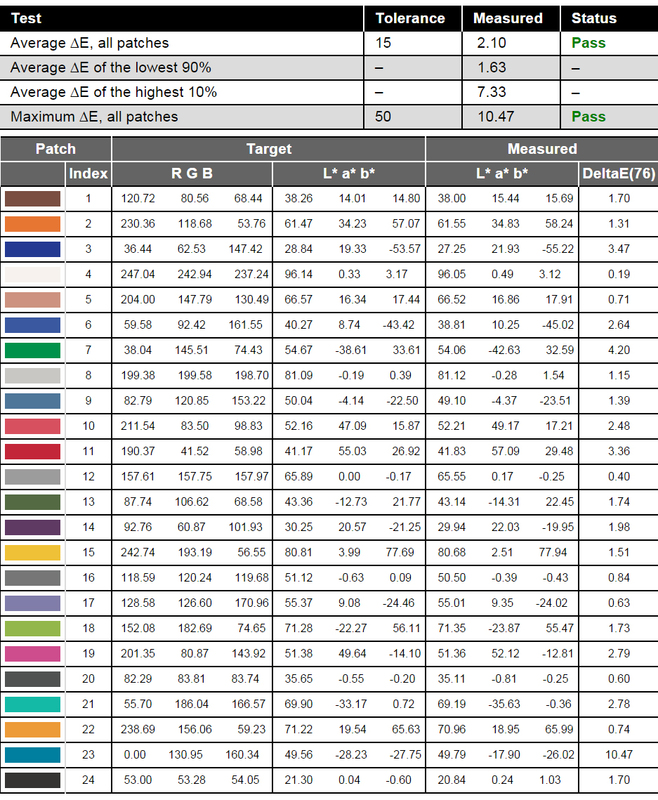 The average DeltaE (76) deviation is 2.1. The measured color accuracy after the profiling is high, given the display type and the laptop class. We rate it as very good. Contrast is high, too – 980:1. 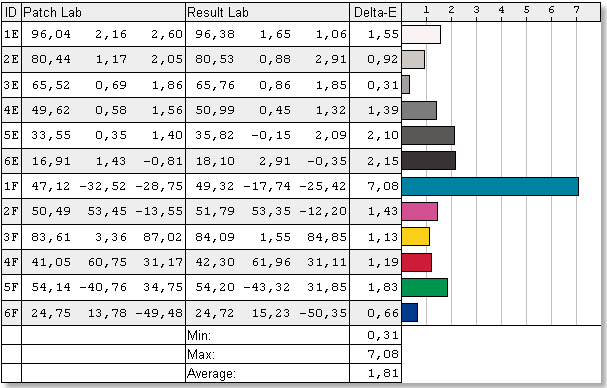 The second calibrator also gave us a good result. 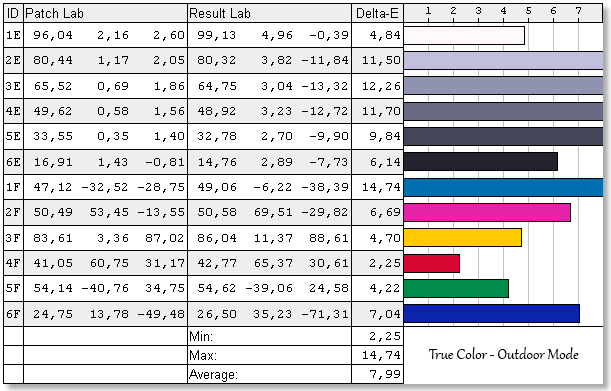 You can see a digital map representing the color sample results of 5749’s display. 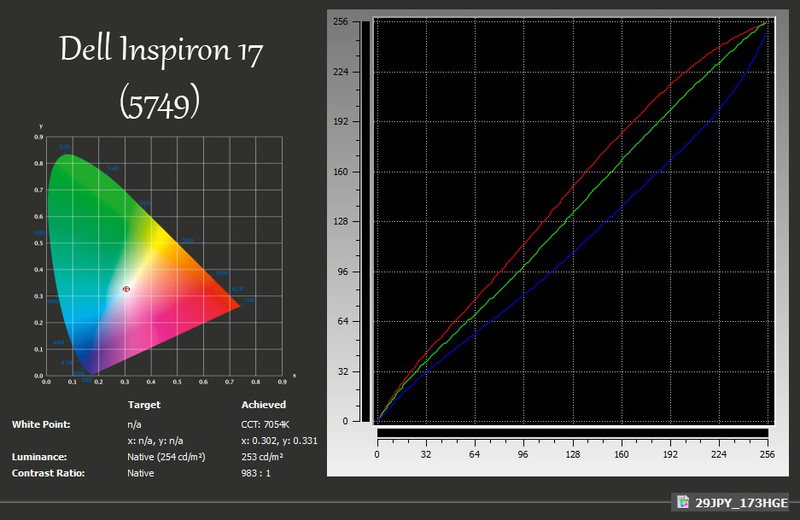 Dell Inspiron 17 (5749) covers 94% of sRGB and 71% of AdobeRGB color gamuts. 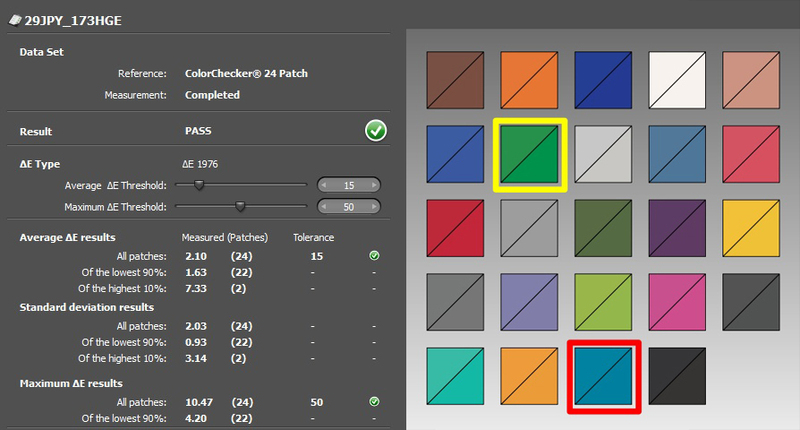 There is a little section from the Web color red spectrum, which remains uncovered. 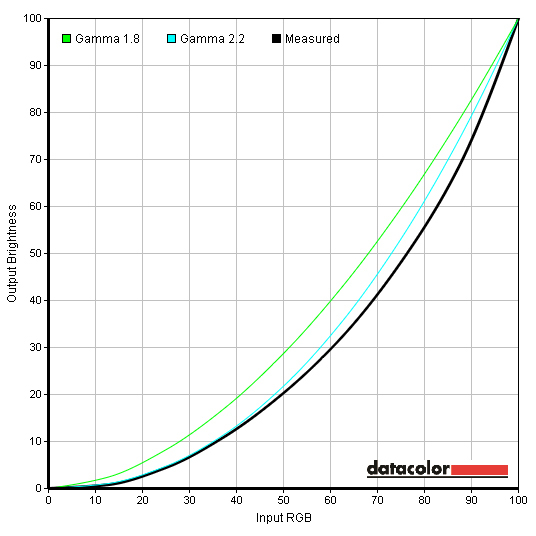 The measured gamma curve deviates slightly from the optimum – the sections with average and high brightness levels will be little darker. 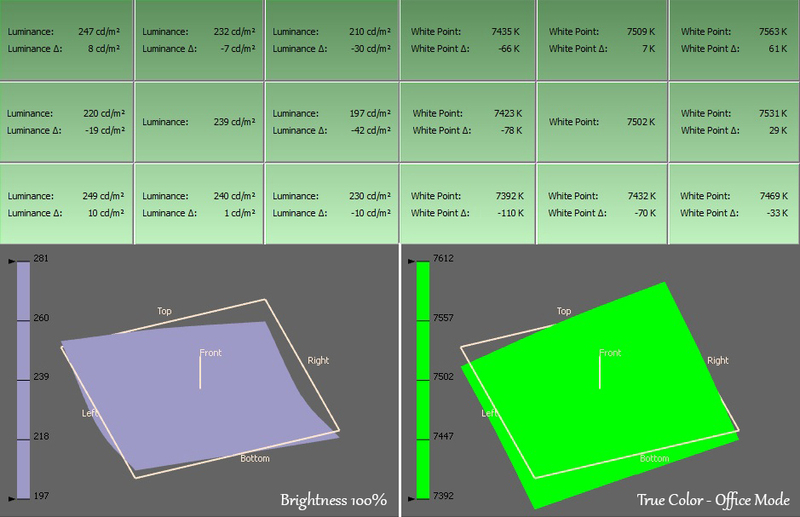 Dell Inspiron 17 (5749) uses a Pulse Width-Modulation backlight across all brightness levels. When the slider is positioned at its highest position, the dark phase is just 5-10 µs and the frequency is high enough – 1 kHz (the period is 1000 µs). Hence, we would define working at maximum brightness as unobtrusive. Things are different at low brightness levels. The relatively high frequency of the pulsations does alleviate the situation somewhat. If we have to rate the “user friendliness” of the screen, our rating will be 2 of 5, or slightly above minimal. We know that Inspiron 5749 is not supposed to be a gaming machine at its core, but it’s entertainment oriented, so we’re still going to measure its gaming capabilities. The graph below illustrates the pixel response time. 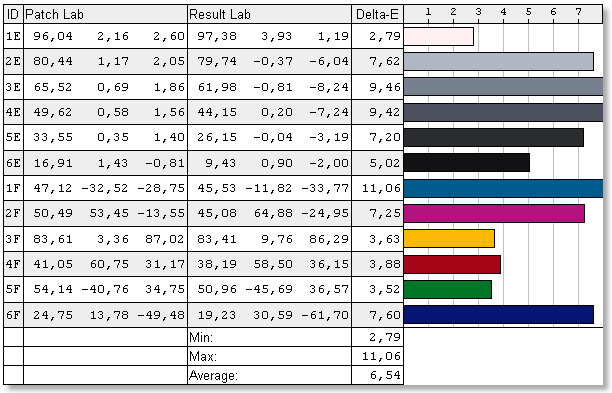 The first thing we measure is “Black” to “White” + “White” to “Black”, starting at 10%, going up to 90%, and vice-versa. That’s what panel manufacturers test, when sharing the response time of their products, so the data can be used for the purposes of comparison. 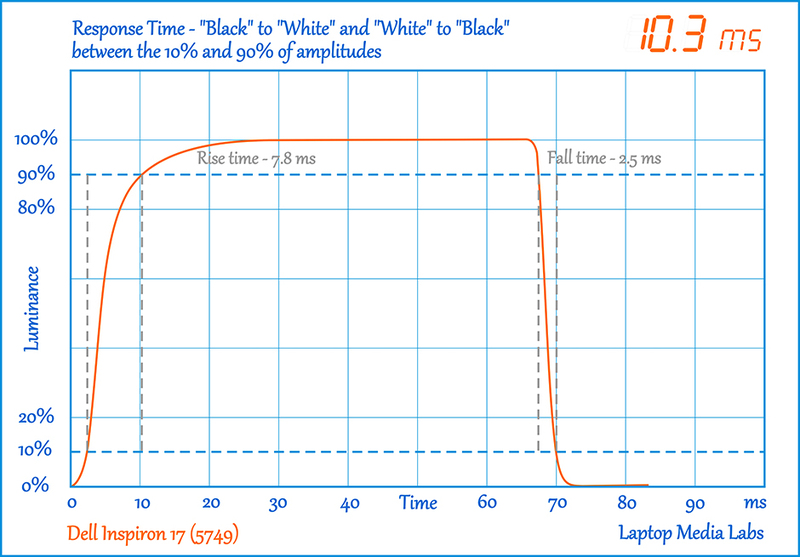 Thanks to the TN matrix, Dell Inspiron 17 (5749)’s display response time (10.3 ms) is ahead of ASUS ROG G501’s IPS screen by a factor of three – 31.4 ms. If 5749 had a better GPU, it would be a great gaming notebook. 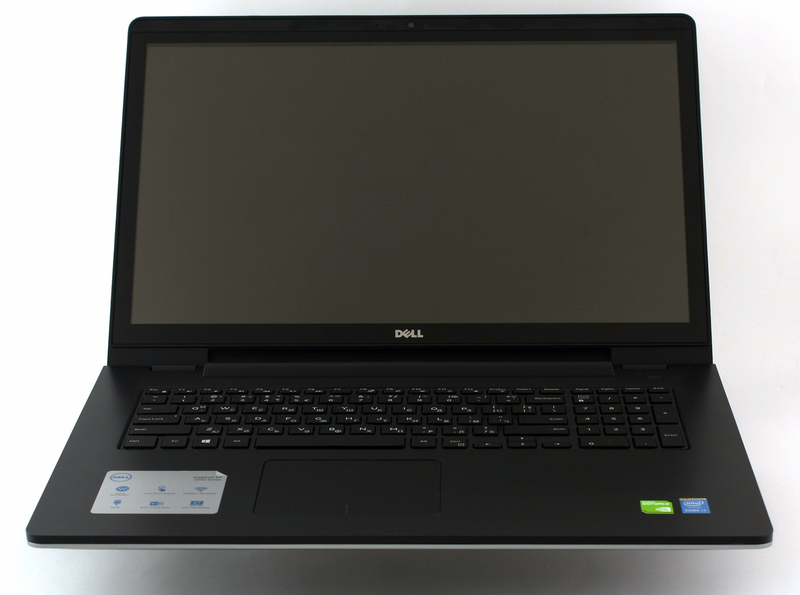 Dell Inspiron 17 (5749)’s display is suitable for gaming, but unfortunately, the GPU isn’t. 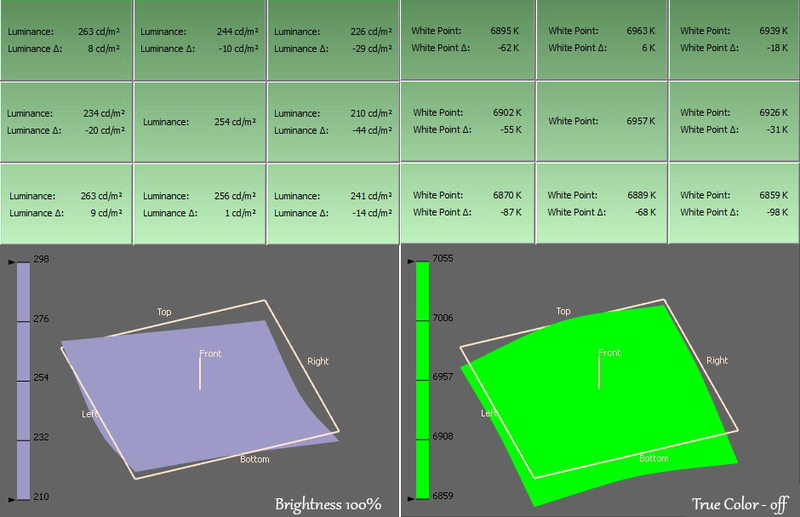 The screen also almost completely covers the sRGB color gamut and has pretty accurate colors after profiling. The reduced viewing angle in vertical aspect and the pulse-width modulation are drawbacks. Our Inspiron 5749 configuration has 40 Wh (4-cell) battery, whose job isn’t that hard, because it has to deal with a ULV processor and not very power-hungry GPU. The battery weighs 260 grams and has a conventional 300 cycle life-span. We run all tests with connected Wi-Fi, 120 cd/m2 brightness and Power Saver mode. As always, we start with the Web Surfing, where we use our custom script which automatically browses through 70 popular web sites. The result is 190 minutes (3 hours and 10 minutes) – to be fair, we expected more, given the bulky size and the ULV CPU. For our Video playback test we use a 720p HD video. Things are a little better here – the new Inspiron lasted 230 minutes (3 hours and 50 minutes). It’s not a great result, but it’s definitely more acceptable than the previous one. 103 minutes of gaming or 1 hour and 43 minutes. Good performance here. Fritz is a chess benchmark which tests the computing capabilities of the CPU with various chess moves. The Intel Core i7-5500U managed to get 5.312 million moves per second. By comparison, one of the most powerful PCs, Deep(er) Blue, was able to squeeze out 200 million moves per second. In 1997 Deep(er) Blue even beat the famous Garry Kasparov with 3.5 to 2.5. Given the large internal volume, the ULV processor and the low consumption GPU, Inspiron 17 (5749) shouldn’t have thermal issues. To make sure, we put it through the hardest test – 100% CPU + 100% GPU load. We ran it for over an hour, and the result is pretty impressive – the mean CPU temperature for that period is 74.7°C – 77.5°C with average frequency of 2.69 GHz, or 300 MHz above the base Core i7-5500U clock. The average cooling fans RPM is 4500. The mean GPU clock is 948 MHz. To be fair, we should say that there are some notebooks on the market now which outperform Inspiron 17 (5749) in every aspect, by far. Dell’s new multimedia station looks sturdy, reliable and even appealing, somehow though, today that’s not enough. We want thin and strong construction, high performance and attractive design. Yes, in one product. On the bright side, Inspiron 17 (5749) is robust, has a long 36 months warranty (conditions may vary in different countries) and has a spill-resistant keyboard. The problem is that it weighs more than 3.2 kg, it isn’t very upgradable (especially for a 17-incher), has a TN screen with PWM across all brightness levels, has a mediocre battery life and is equipped with not less than adequate CPU and GPU. Unfortunately, the price isn’t great too, so we should recommend that you look around a little bit more before opening up your wallet. Никак не могу понять, у него клава с подсветкой? просто везде пишут что подсветки нету, а тут как бы есть? или это зависит конкретно от комплектации?